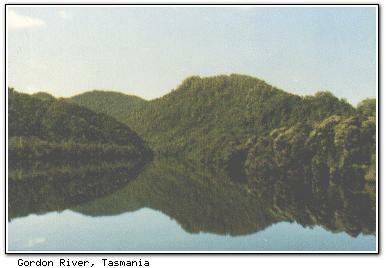 The Gordon River , in the Franklin-Gordon Wild Rivers National Park, is a spectacular blue ribbon through the forests of south-west Tasmania. 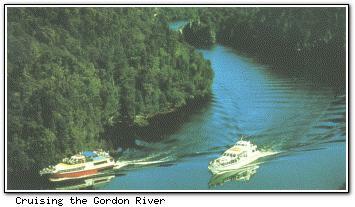 Departing from Strahan, it is possible to cruise the Gordon (bottom). Huon pine stands are to be found on each bank of the river, and when the cruise reaches Heritage Landing, it is possible to walk through the rainforest to see one particular specimen over 2,000 years old. The Gordon's mystical dark waters are naturally coloured by tannin leaching from the surrounding rainforests. The downstream portion of the Gordon River reached the TV screens of the world in the early 1980's when it was scheduled to be dammed as part of a hydro electricity scheme, but the federal government intervened to prevent the project.